Released for free following the release of Red Alert 3. 3.03p fan patch is highly recommended to install. If you want a modernized C&C experience, check out OpenRA. Language support can be further extended with language add-ons. CD/ISO installer is 16-bit and doesn't run under modern operating systems, see Availability for solution. Also available as part of The First Decade. The Ultimate Collection, bundled with other games in the franchise up to Tiberian Twilight. OpenRA is a modernized open-source version of with mature support for "Red Alert". PortableRA is available in installable or portable (stripped, multiplayer-only) form with add-ons. Extra contents included (PSX-exclusive cutscenes for the expansions and music). RA1 Installer is a special installer that can either download the game, install it from old CDs/ISOs or patch an existing installation. Extra contents included. 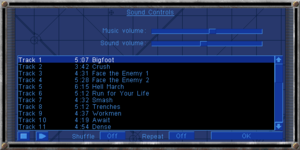 RedAlert1.com is a bare-bones version optimized for multiplayer (small size, portable). Missions, music and cutscenes are omitted. 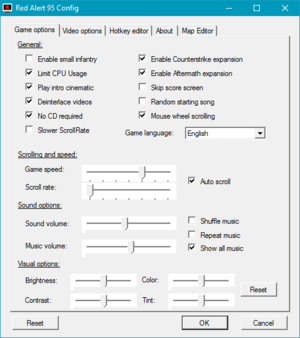 The music and map editor are downloadable inside the CnCNet settings. The site offers a Mac-compatible version too. Mac OSX Wineskin package - Mac-compatible web installer that works outside the box. Includes single-player campaign and extra contents for the single-player. Like many 32-bit games released during the mid-'90s, the game's installer is 16-bit. This and some other issues prevents you the game from being installed (using the ISOs released by EA or the game CDs) on modern operating systems and PCs. The RA1 Installer (see above) includes an option to install games from original CDs/ISOs and patch the installation afterwards. More information available at CnC-Comm forums. 1024x768 resolution using the 3.03p patch. Patch is included in the installation via RA1 Installer (see above). Not needed for fan-made packages, it is already present there. Latest official 3.03 patch and community fixes (over 130). In the compatibility tab all compatibility options should be turned off. 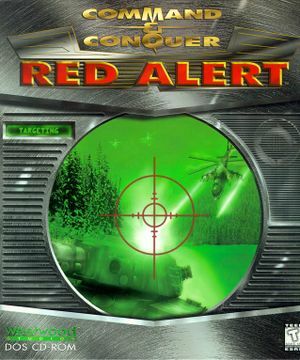 Support for regular Red Alert installation, The First Decade and The Ultimate Collection. External general settings (for the fan patch). redalert.ini contains normal game settings. ddraw.ini contains CnC-DDraw settings (present after patch). 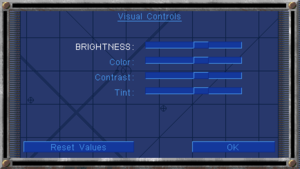 External options menu (for the original release). External video settings (for the fan patch). A fan patch is required. Disable borders, enable windowed, then stretch the resolution in the patch configuration program. A fan patch is required. Be sure to enable OpenGL too. 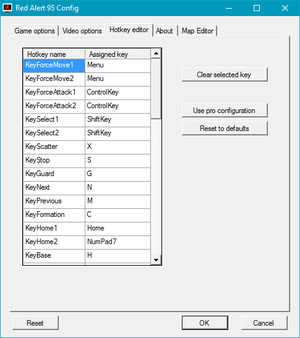 External input settings (for the fan patch). Fan translation, see Language add-ons. Partial audio support; fan translation, see Language add-ons. RA patch also adds support for Language add-ons. Use the 3.03p fan patch to enable modern LAN support. The original multiplayer service is no longer available. Use the 3.03p fan patch and CnCNet.org to re-enable support. An unofficial community-run online service for older C&C games. Uses an external client to launch its own improved lobby that supports private games, pre-determined alliances and spawn locations, its own online map folder, map preview, spectator mode, kick/ban and better chat capabilities (ignore, whisper, Mumble voice chat). Predominantly used by Red Alert players. Already included in the 3.03p patch. A semi-official, community-run replacement for Westwood Online (WOL), Westwood's online service. In-game 'Internet' menu redirects to this service. XWIS service is not used by online Red Alert community. This list assumes you're using the patch. If you experience a new game issue, please make a support thread on the CnC-Comm forums. Left-handed mouse setups have problems with selecting multiple units. If you have problems with The First Decade or The Ultimate Collection, be sure to check this FAQ on EA forums. If you have installed the patches properly. If everything in the compatibility tab is unchecked. 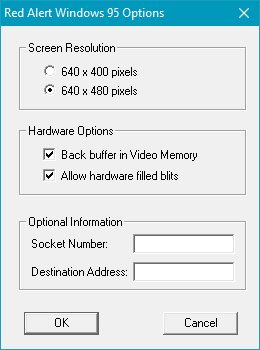 If you have enabled "Back buffer in Video memory" and disabled "Allow hardware filled blits". If you may be able to initiate the game/lobby with administrator privileges. If you changed from CnC-Ddraw to DDwrapper in Video Options. 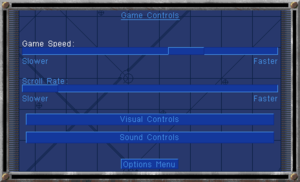 Edit ddraw.ini and enable "singlecpu"
While in-game, press Esc to open a menu, press game controls and move the game speed slider to adjust the game speed or scroll rate slider to adjust the scroll speed. If you really want to play fullscreen, you might want to check how to enable Borderless fullscreen windowed mode. If you happen to have the game on CD, that means No-CD option is turned on. Either turn off the option in the configuration tool or download the videos. C&C has support for external maps, both multiplayer and singleplayer. CnCNet includes its own online map folder. 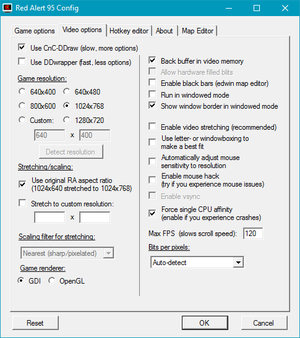 Map editors can be downloaded inside CnCNet's game options. OpenRA - community developed recreation that tries to modernize the classic gameplay and UI. ↑ C&C Comm Center - CnC95 laggy and unresponsive after gold edition patch, help!